Arkansas River Maps from Granite to Canon City! This map gives an overview of all the rafting sections of the Arkansas River in Colorado. Each of these five sections can be rafted in one day. Sections can also be combined into 2-5 multi-day river trips with comfortable riverside camping or deluxe Inn to Inn all-inclusive options. Click on an outlined section to see details including rapid names. Printer-friendly and souvenir-quality low-resolution or high-resolution versions of this map are great to bring along when visiting us. If you and your friends or family are interested in Arkansas River Rafting Trips, or perhaps viewing the beautiful scenery whilst rafting the Royal Gorge, then contact Wilderness Aware Rafting where our experienced, knowledgeable, and well trained staff can determine the best trip for you! 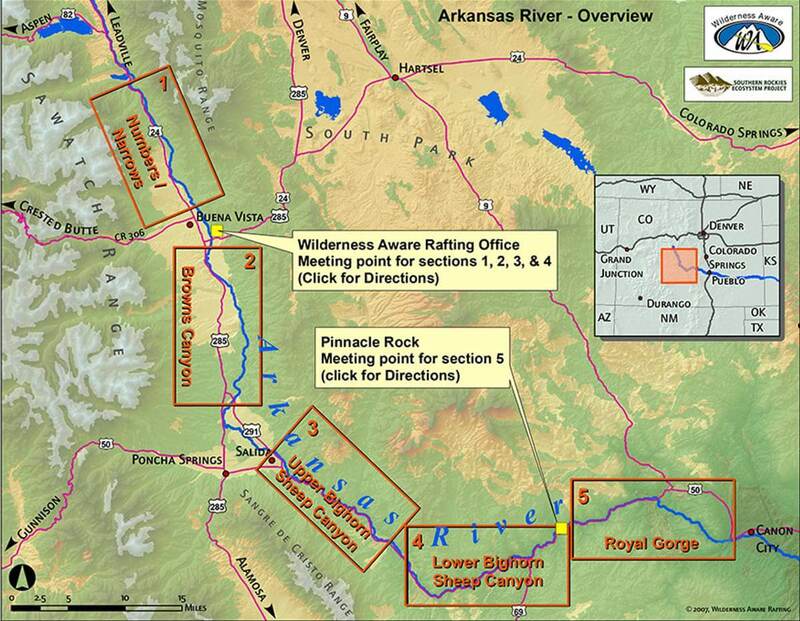 Browse these maps for more detail on the various sections of the Arkansas River. The Arkansas River is the longest continuous whitewater rafting in Colorado. The most popular section (Browns Canyon) is located near the town of Buena Vista, Colorado.